Who is “First Man”? No, not Adam. 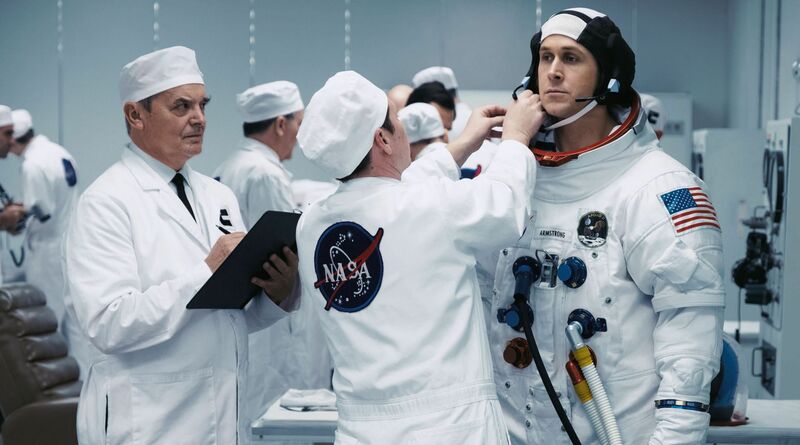 It’s Neil, as in Armstrong, the perpetrator of the inaugural footstep on the moon and very much the subject of director Damien Chazelle’s follow-up to his almost-Best Picture, “La La Land.” It is a remarkably idiosyncratic movie, given the usual heroic/fantastic presentation on screen of space travel—or anything involving the heavens. In many ways, it is sublime. And the best way of explaining why is by addressing the ridiculous. The sputtering right-wing outrage that erupted after the premiere of “First Man” at the Toronto Film Festival this year was sparked by the film’s “neglecting” to include the planting of an American flag on the lunar surface. Never mind that the flag is basically all over the place in the film, including the moon. Never mind that the griping came from people who hadn’t seen the film (including tweeting-from-the-hip Marco Rubio). What one realizes after seeing the movie is that the kind of gesture represented by the planting of a flag would have been antithetical to the Armstrong who inhabits the film. Death is rampant in “First Man,” as it was in the Gemini and Apollo campaigns—one forgets, amid all the glory, then and now. As portrayed by Ryan Gosling, he is a man shut down emotionally, closed off from almost everyone, most notably his loyal wife, Janet (Claire Foy), and disinclined to play the media game, much to consternation of his Congress-appeasing overlords at NASA. When Armstrong states “one small step for man,” which accompanied his contact with the lunar surface, the viewer almost cringes—because delivering such a line must have made Chazelle’s Armstrong cringe. The astronaut we come to know is so allergic to counterfeit gestures he can barely answer questions at a press conference. One of those questions is played for laughs, and shouldn’t be. “Did you feel closer to God?” he’s asked (I’m paraphrasing) after the near-disastrous Gemini 8 mission, a terrifying set piece that begins with an homage to “2001 Space Odyssey” (you can feel the filmmakers yearning to cue up “The Blue Danube”—composer Justin Hurwitz has written a virtual clone) and that then disintegrates into chaos, for them and for us. The question from the reporter will provoke eye rolls, but it is a small moment that illuminates larger points about the film—one of them being that, regarding “First Man,” the emphasis should be on “man.” There is no question that Chazelle was entertaining cosmic questions in the making of his film, with its screenplay by Josh Singer (based on James R. Hansen’s book). The moment when the Eagle hatch opens and the astronauts confront the moon, stark, mute, its horizon bisecting deep space, is simply thrilling, spiritually and otherwise. Who has come before, or when, or if, is a matter of conjecture. Or faith. This contact with an astral body just happens to be the “First” intrusion by humans. It is not about nationalism, or jingoism or any ism except perhaps humanism. Did Neil Armstrong have a death wish? Death is rampant in “First Man,” as it was in the Gemini and Apollo campaigns—one forgets, amid all the glory, then and now. Armstrong’s fellow NASA recruit Elliott See (Patrick Fugit) died early in a botched plane landing. Neil’s close friend Ed White (Jason Clarke) is killed in the Apollo 1 fire, along with Gus Grissom and Roger Chaffee (Shea Wigham, Cory Michael Smith). Trumping all other calamities, however, is the loss of the Armstrongs’ 2-year-old, Karen (Lucy Stafford), which occurs early in the film and seems to loom as the cause of Armstrong’s emotional insularity. Was it? The very first scene, like many, shot close up, almost claustrophobically and from an Armstrong-ian point of view, involves the astronaut-to-be as a test pilot, bouncing off the atmosphere, rocking and rolling through space and coming less than a second from crashing before he pushes the ejection button. His attachment to life seems tenuous from the start. “First Man” is, first off, apolitical. It is not about nationalism, or jingoism or any ism except perhaps humanism—the human in question being a frustratingly taciturn being, and not a hero, not in his own eyes. Armstrong seems to approach everything with the cool of an engineer, which is what he was. As he prepares for the moon mission, his wife tells him to talk to their sons. Armstrong has said nothing to them and seems prepared to leave without doing so. “Are you coming back?” one asks, finally. “We have faith in the mission,” the father begins, as if his son were a reporter at one of those despised press conferences. Armstrong does give us something to hang our hearts on, in the end—this is a Hollywood movie, after all. But it’s oh so hard. And the movie makes us feel it. While I would agree that the movie was not heavily political, the race to the Moon was a competition between the Soviet Union and the US, hardly an apolitical siuation. In real life, the successful culmination of that race was the planting of the US flag on the moon. Omitting that event would be like having a film on Christ's time on Earth but not depicting the cruxcifixion, excusing it with statements like "Oh you could see him on the cross in the background, you get the idea." Ludicrous. And in the first scene, Armstrong did not "push the ejection button (there is no such button)" while flying the X-15. He landed successfully, if not smoothly, in the desert near Edwards Air Force Base. Nixon threw the manned lunar program into the dustbin. The next manned program was the space shuttle. A magnificent tour-de-force, it unfortunately turned astronauts into truck drivers, risking their lives in the process. So now it's back to re-entry capsules and unmanned launches for material. I hope we can get man back into space but the cosmic radiation is a huge barrier. Right now, mother earth is the only safe place for our bodies. Indeed to utilize Internet we are so near one another in disdain it, we live far away to one another or live in various nation occasion one corner of the world to another corner of the world. In this article, you told the job of online life locales which is the extremely indispensable job. I actually try to get assignment help but this will be very good approach found here. Awesome Review dear! Describe total wave of the movie and loved it.